In airports, there are security machines that use x-ray technology to scan both passengers and luggage in order to make sure no weapons or drugs are going to be taken on board. After the tragedy of September 11, 2011, air traffic security tightened significantly. Now, Transportation Security Administration (TSA) security officers use x-ray stations to scan for items that used to be considered innocuous but which are now considered potentially lethal, such as flammable items, items with sharp edges, and even liquids in excess of 3 ounces. 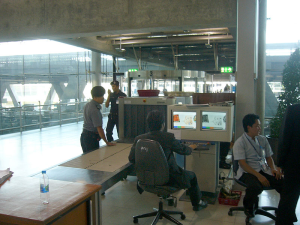 "Luggage screening device at Suvarnabhumi International Airport, Bangkok, Thailand, January 31, 2007" by Mattes is licensed under Public Domai. 2015 Prohibited Items. https://www.tsa.gov/traveler-information/prohibited-items, accessed July 15, 2015. 2015 How Stuff Works: How Airport Security Works. http://science.howstuffworks.com/transport/flight/modern/airport-securit..., accessed January 7, 2015.